We are working on raising our profile through displays, appearances at fayres, fetes and festivals (not Glastonbarry yet!) and giving talks to clubs and organisations. Raising the profile in Penarth! Judith Lewis was invited to speak to the ladies of the Thursday Club in Pontyclun on July 13th on the topic of Soroptimism. There were many who had never heard of the International organisation. 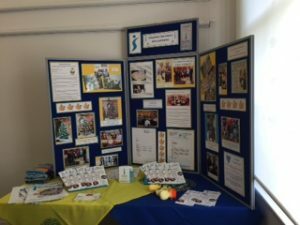 They, and even some of Judith’s own friends who have supported our fundraising events over a number of years, were surprised and impressed at the variety of activities undertaken by Soroptimists. 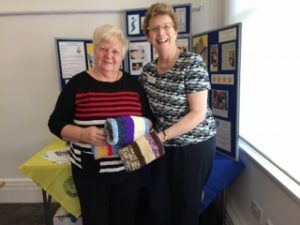 Judith took along some visual aids to illustrate her Powerpoint presentation which included a Dementia muff , knitted chicks and the Club’s displays boards which showed the various Club projects. The response to the talk was very positive, it was a very enjoyable evening for the members. In June Pat Salt was the guest speaker at the Monday Club’s weekly meeting in the Millennium hall, Barry. She was made very welcome by the members. This new initiative arose as a result of a casual query about what Soroptimism is. A list of members who are happy to talk to groups and organisations about Soroptimism has been collated by Jacky. Our first talk was given by Delor at Barry Library to the RSVP knitters on Monday 13th March. 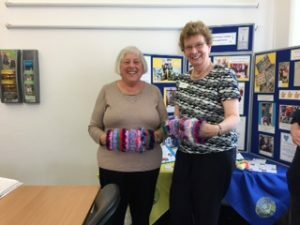 This group of ladies are busy knitting the cushions for dementia patients, a joint venture with our club. They seemed to have enjoyed themselves! Delor is in both photos. We now have boards that show our club activities and information about Soroptimism in general. These boards and a powerpoint can be taken to all interested groups or organisations. Thanks to Lynne for the boards.